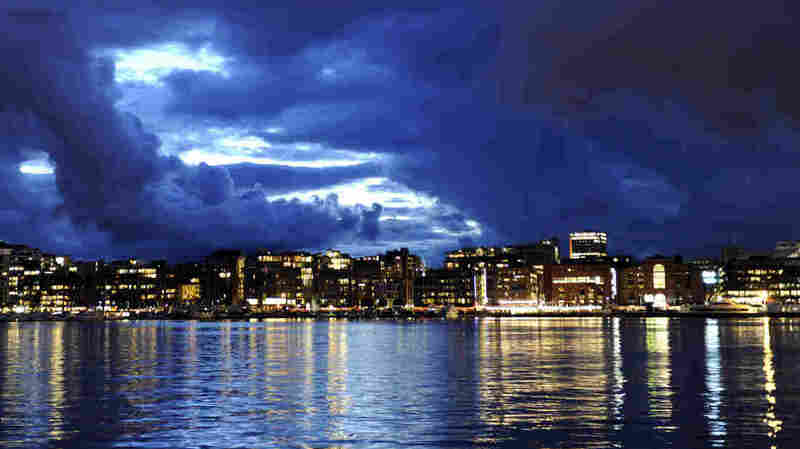 Jo Nesbo's Fiction Explores Oslo's Jagged Edges The Norwegian author does his best to show NPR's Eric Westervelt that Oslo really does have a seedy side. In his fiction, at least, Nesbo's city is full of shady characters who draw the attention of the reckless, alcoholic detective Harry Hole. Hole's most meaningful relationship is with bourbon, by the bottle. Booze is the detective's Achilles heel: He reaches for solace by the drop but often it just makes him more miserable. The real-life residents of No. 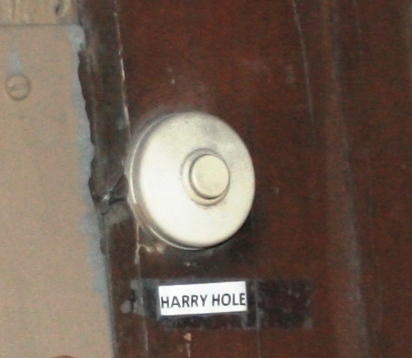 5 Sofie's Gate have paid homage to Nesbo's fictional detective by putting Harry Hole's name on the doorbell. Nesbo takes me to No. 5 Sophie's Gate in the hilly, cobblestone street neighborhood of Bislett. This is Harry Hole's fictional address. 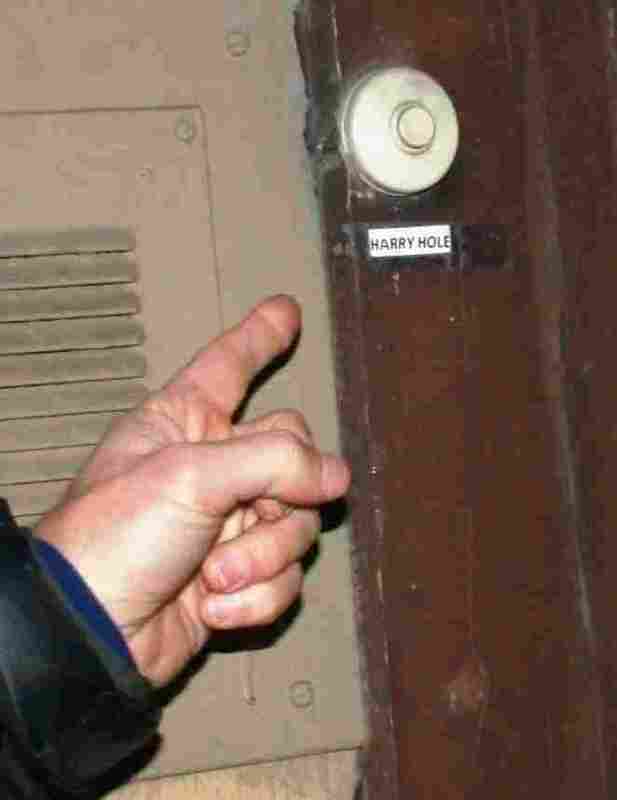 Yet Nesbo appears genuinely surprised to discover the real-life occupants have put Harry Hole's name on the doorbell. As we stroll around Oslo, Nesbo says Harry tries not to get too close to people because nothing good ever comes of it. "I think that is, you know, Harry's experience in life, and that is, that people that he loves, they will be taken away from him," Nesbo says. "His mother died when he was young. His first girlfriend committed suicide. Getting friendly with Harry is like getting bitten by a vampire." The author, who is in his early 50s, is dressed in jeans, a white T-shirt and a blue sweat jacket. He's unshaven, though his face looks more like just-went-for-a-hike healthy rather than disheveled. He looks everything his alcoholic, hard-edged detective is not. Nesbo's own addiction these days is rock climbing and rock 'n' roll. He tries to find time to write in between climbing and travel adventures. And in between working as a crime novelist, Nesbo works as the lead singer in one of Norway's most popular pop rock bands, Di Derre. He's also been a successful stockbroker, a journalist and, early on, a star professional soccer player in Norway's premier league. So, has he ever failed at anything? 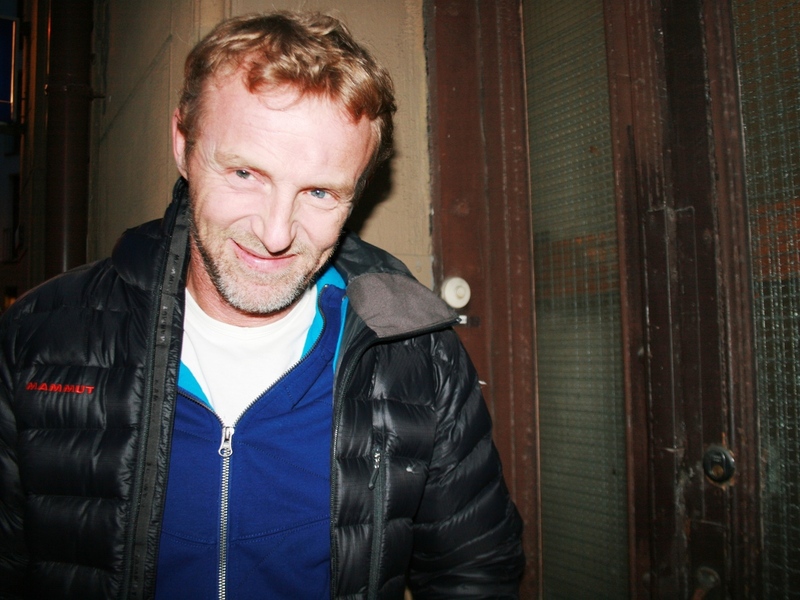 "I was a really bad taxi driver," Nesbo says, laughing. "I only collided twice, but it was one time too much." We hail a taxi — one with a successful driver — and Nesbo instructs him to take us to Oslo's seedier sights. You know, heroin and hookers. Your typical Norwegian night out. We head downtown through well-kept streets, past sharply dressed young professionals out for an evening drink. Nesbo is working hard to convince me Oslo has far more jagged edges than meets the eye. Around the corner from Henry Hole's fictional flat, Restaurant Schroder serves up real, traditional Norwegian food. "Yeah well, you see a woman over here? She's a working girl. It's not that busy right now," he says. "And down there on that plaza? They're dealing drugs." Nesbo takes this slice of the city and runs it through his own creepy, fictional blender to get Detective Hole's Oslo. 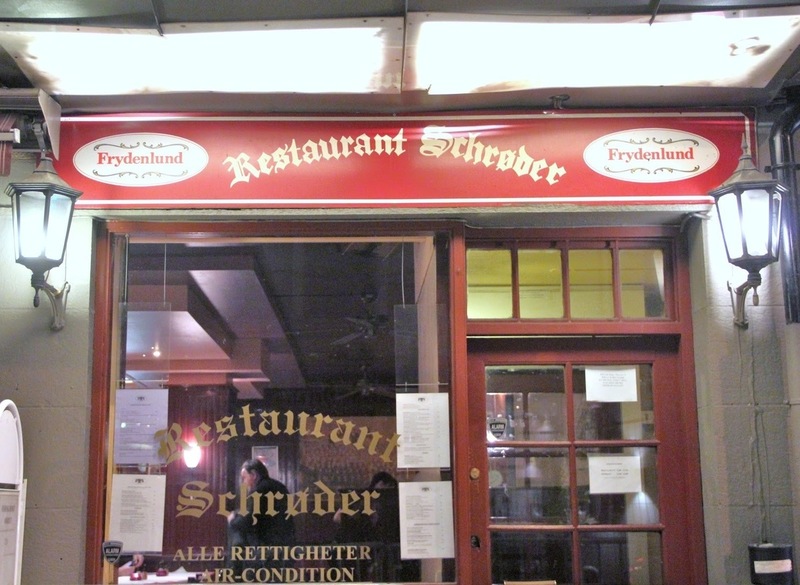 Harry's dimly lit local haunt is based on the real-life local restaurant named Schroder's. Inside, photographs of 1920s brewery workers hang from dark, wooden walls and a no-nonsense staff serves up amber ale and overcooked beef. In Nesbo's novels, Harry often comes here to dry out a bit. "I was sort of considering the idea when I invented the character, the idea of the, you know, traditional, hard-drinking American hard-boiled detective," he says. "But I decided that I didn't want that. So I made him a full-blown alcoholic." The novelist was enjoying a workout at a rock-climbing gym last July when Oslo was hit by real-life horror. Extremist Anders Behring Breivik set off a car bomb downtown and then gunned down kids on a nearby vacation island. In all, Brevik killed 77 people. Nesbo calls it chilling, disturbing, more horrific than things he has dreamed up in his novels. "I don't feel like there's an obligation to write about it. But I think it's inevitable that it will creep into my writing whether I want it or not because it's there, you know?" he says. "I was here in Oslo when it happened." After a plate of meatballs and mashed potatoes, we head back outside to see if Oslo's streets have gotten any darker. Despite the late hour, it's still not quite noir enough. This is fitting, considering that Nesbo doesn't really consider himself as part of the Nordic Noir tradition. Nesbo — a former stockbroker, journalist and professional soccer player — says he doesn't consider himself to be part of the larger Nordic Noir tradition. That is, crime fiction as thinly veiled social criticism like the late Swedish writer Stieg Larsson. Nesbo has sold millions. He's had half a dozen best-sellers, and a film version of his bestseller The Snowman is set to be directed by Martin Scorsese. Yet the promotional material for some of his books still calls him "the next Stieg Larsson." "I'm not thrilled, but I'm not that annoyed either. I heard somebody in the U.K. now being branded as the new Jo Nesbo, so I guess he or she is probably a little bit annoyed, too," he says. Nesbo's fascination with the gloomy side of his hometown seems at odds with his relatively sunny disposition. He is a nice guy and little resembles his morose characters. "They say that every writer, they write about themselves. I think that's to a certain extent true, but also we are creators of fiction," he says. "So I do, you know, make Oslo into this city that does and does not exist, and Harry's a character that also exists and does not exist." Nesbo then climbs out of the taxi onto his mountain bike and heads off into the Oslo night. It's rough out there, and Nesbo is one of the few not wearing a bike helmet.